How can fall be fast approaching? It seems like summer just started, but soon the leaves will change and the air will get a chill and everything will be apples and pumpkins. I created a fall parts of speech sort to work on with my daughter in preparation for school in the fall. This was her first introduction to nouns, verbs and adjectives so we worked through this activity together and by the end, she was doing it on her own. First, I set up a cup for verbs, adjectives and nouns. I explained to her what each word meant and showed her the picture on the cup as an example. Then, I spread out a few of the 15 picture card strips at a time so I didn't overwhelm her. She would select a strip and try to guess the word based on the picture. I would read her the word that matched the picture. Then I would say, "Is it something you do, a way to tell more about something or a thing?" From those definitions she usually picked the correct cup to slip the paper into. Then I would say, "Right, that is a verb (or adjective or noun)." That way she was becoming familiar with the parts of speech language. We continued until all of the picture cards were sorted correctly into the cup. By the end she did not even need my reminders and could figure out exactly what cup to sort the picture cards into. This was a great introduction to parts of speech with a lot of scaffolding and support from me. Students that are already familiar with parts of speech or that can read the words, would be able to use this as an independent activity or literacy center. 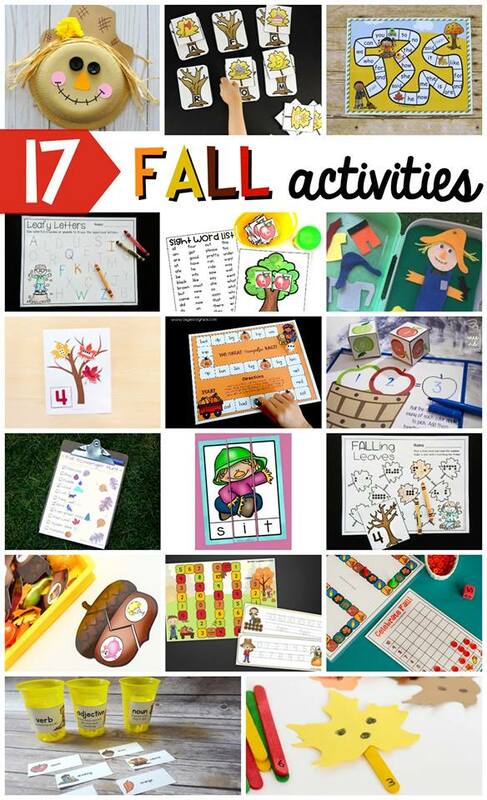 I've got this Fall Parts of Speech Sort for you as a freebie (scroll down to the bottom of this post). I also have some other awesome fall ideas and freebies for you from some amazing bloggers. Check out the list below. Would you like to try the Fall Parts of Speech sort? I have it for you for free. All you have to do is click the button below, enter your information and they will be emailed to you directly.